AUSTIN STEVEN'S ADVENTURES: COMING SOON TO A JUNGLE NEAR YOU! Austin Stevens (a.k.a. "Snakemaster") has been known to brave seedy bat caves, alligator-infested swamps and pounding waterfalls for the perfect photo. The renowned wildlife photographer is gearing up for some of his most challenging adventures to date. His quest to photograph the world's most secretive and dangerous animals takes him around the globe and through the toughest terrain on the planet. Follow Austin as he makes his perilous trips around the world to find and capture - on camera! - the world's rarest and most deadly animals. Austin is on a mission to seek out some of the deadliest animals in precariously formidable terrains. On each episode of AUSTIN STEVEN'S ADVENTURES, Austin sets out in search of the deadliest, most venomous and rarest beasts. Whether he's tracking wild hyenas in the Ethiopian highlands, coming face-to-face with deadly snakes, or fishing with Grizzly bears, Austin will stop at nothing to get close enough for that perfect shot. Come along on AUSTIN STEVEN'S ADVENTURES across the world - Canada, Ethiopia, Sri Lanka, Africa and more - to explore amazing but deadly fauna, in some of the most awe-inspiring landscapes. Paddling through alligator-infested swamps, navigating his way out of razor-sharp sawgrass, battling torrential rivers, downpours and mountainous terrain... Austin will need more than a rabbit's foot to survive these missions. Relying on his instincts, expertise and the age-old knowledge of the locals he meets in each country, Austin pushes his limits and luck to get the ultimate close encounter. Get ready for more of Austin's tongue-in-cheek humour, unscripted wildlife drama, and amazing images of Earth's incredible wildlife, on AUSTIN STEVEN'S ADVENTURES. Austin ventures into one of the world's last wildernesses, "The Great Bear Rainforest", in western Canada in search of the park's most dangerous inhabitant. The Grizzly Bear can kill a man with a single swipe of its paw but it is by nature elusive and shy. Austin has timed his journey perfectly. He will be making his way up river into the heart of the rainforest following the annual salmon run - the bear's main food source. Along the way, he will have to cross some of the most rugged and impenetrable terrain on earth, and be on constant alert for black bears and Grizzlies. On the Yucatan peninsula, carvings of a mythical beast adorn the walls of countless Mayan ruins and locals tell of a feathered serpent god - the Quetzalcoatl. The Quetzalcoatl is the only snake on the planet that Austin hasn't encountered face-to-face. Getting to the serpent's breeding grounds will require hiking through a jungle teeming with tarantulas, scorpion and the chilling call of howler monkey. To navigate this landscape successfully, Austin will need to learn the skills and secrets of the local Mayan descendants. As darkness falls over the Ethiopian highlands, a familiar call echoes - the cackle of the spotted hyena. Hyenas are reviled on this continent as predators of livestock and humans. Their jaws are so strong they can break through bone in a single bite. But Austin has a soft spot for these most prolific predators and he's journeying to Ethiopia to investigate and hopefully dispel the stereotype of Africa's hyenas. To find these animals, he has to venture into the heart of the Awash and into the villages of the Afar people. Austin ventures through Florida's Everglades in search of a giant alien invader. Burmese pythons are thriving in this area and Austin wants to see them in action. Despite their growing numbers, these colossal predators are extremely difficult to find. Join Austin as he paddles through alligator-infested swamps, navigates razor-sharp sawgrass, and takes an airboat ride with a native-American - all to locate a potential python site. When he sees a baby python born in the wild, Austin knows he's hot on the trail of pythons. Austin heads to northern Australia, determined to photograph the extraordinary creatures and reptiles that live there before their pristine habitat is changed forever. As with the rest of the continent, the area's wildlife is under serious attack by a foreign and deadly species of cane toad. After witnessing hordes of these toxic invaders on his way into the region, Austin heads deep into the unpopulated wilderness, navigating treacherous terrain by jeep before heading out on foot. Austin's mission in Swaziland brings him terrifyingly close to the second largest mammal on the planet - the white rhino. But Austin has set his sights even higher and wants to find the notoriously aggressive black rhino, which can charge at 50km an hour and attack and obliterate virtually anything with its horn. It will require all his knowledge, patience and perseverance to get as close as he can, and then a nerve of steel to stay. Austin travels to South Africa in search of leopards. Feared as man-eaters, these deadly hunters are so elusive that few people ever even manage to spot one. But Austin is determined to find a mother and her cubs, and return home with a rare family portrait. When he eventually finds fresh leopard prints and a half-eaten kill hidden high up in a tree, he knows he's close to finding leopards. But can he get close enough to get his photographs and more importantly, will he get out alive? 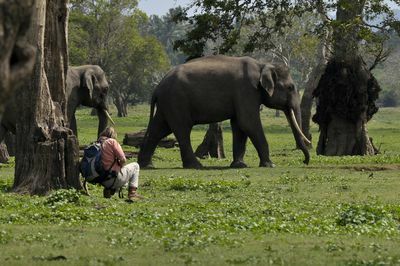 Austin is in Sri Lanka searching for Asian elephants. He's spent years photographing their majestic African cousins and now he wants to get a shot of the rare, tusked Asian elephant, also known as "tuskers". Not just that, he wants a shot of one charging straight towards him! Austin heads to the ancient reservoir at Minneriya where he finds the biggest herd of elephants he's ever seen. Austin gets his photographs, but he'll need to summon all his courage to be able to stand his ground when they come charging straight for him. Austin's latest assignment is to photograph the deadly Vampire Bat - a mammal known to live deep in underground caves. But there's a hitch: Austin is claustrophobic. Hoping to avoid the bats' dark and cramped lair, Austin heads to the western edge of Ecuador's Amazon rainforest. The only way into this tangled rainforest is by river; a day's kayaking takes Austin into the heart of the jungle. After a successful midnight stake out, he snaps the perfect shot of a killer bat drinking its fill. Austin is thrilled but he's still one photo short. The only way to complete his assignment is to enter the bats' cave after all. 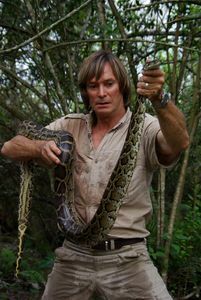 Austin is travelling back into snake country, and this time he is looking for the largest snake found in all of Africa - the African Rock Python. The Rock Python is huge, intelligent and notoriously aggressive - a dangerous combination. Austin is heading to Natal where the first monsoon in six years is coming to an end. The extreme rains are going to awaken some monster-sized snakes. Austin works his way through wet, leech-infested rainforest in search of giant serpents. 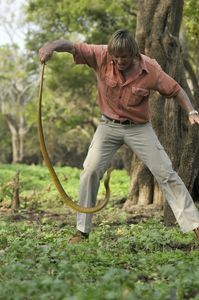 Will Austin get over his claustrophobia and enter the burrow of a 15-foot python or will the snake get to him first? Austin is heading to Botswana to track and photograph the king of the jungle, the African Lion. He wants to photograph a pair of brothers who have a fierce reputation among the local bushmen. They can be heard roaring across the valleys, but Austin must approach them up close and get accepted into their coalition to get the shots he wants. He tracks through forest, dodges snorting buffaloes, shares his tent with an angry mongoose and creeps on all fours within metres of two 500 lb lions. For years Austin has been travelling through the bush avoiding hippos wherever he can. As the most dangerous and aggressive mammal in Africa, Austin knows many people who have been killed by giant hippos and he's genuinely afraid of them. Seeking them out seems crazy, but Austin is on a mission to photograph males fighting for territories, a bloody clash that can end in death.